Carlsbad real estate covers a lot of territory–with a number of distinct neighborhoods. Our current highlight is Arroyo Vista, a charming and newer Carlsbad subdivision that borders Olivenhain to the east and Rancho Santa Fe Road and La Costa Valley to the west. Arroyo Vista is a relatively smaller subdivision located in one of south Carlsbad’s more desirable La Costa subdivisions and is served by excellent public schools including nearby Olivenhain Pioneer Elementary School (a National Blue Ribbon School), award-winning La Costa Canyon High School and Diegueno Middle School in nearby Encinitas to the immediate south. Arroyo Vista is unique in Carlsbad real estate in that it is a newer and upscale subdivision that also has a fair number of highly desired single-story homes–which also sell very quickly. 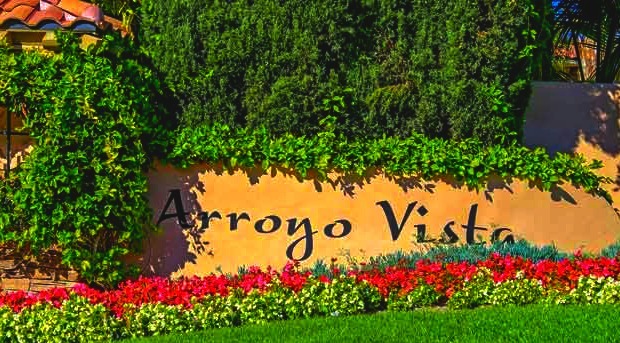 Homes in the Arroyo Vista subdivision range from just under 3000 feet to over 4000, with prices currently starting in the very high $800’s n and running to over a million. The location of Arroyo Vista is also superb. It is only a few miles to several fine beaches, is very close to the world famous Omni La Costa Resort, fine shopping, parks, Scripps Encinitas Hospital and outstanding medical care. Additionally, Arroyo Vista likely got its name from the easily accessible Arroyo Vista soft surface trail which is currently only a half mile long, but the City of Carlsbad plans to eventually expand eastward through an open space corridor to Calle Acervo. Note: Google frequently gets the Arroyo Vista subdivision mixed up with the Arroyo Vista street in Carlsbad’s SeaPoint Tennis Club–and where we recently sold 3166 Arroyo Vista in Carlsbad! Based on information from California Regional Multiple Listing Service, Inc. as of April 23, 2019 22:21 and/or other sources. All data, including all measurements and calculations of area, is obtained from various sources and has not been, and will not be, verified by broker or MLS. All information should be independently reviewed and verified for accuracy. Properties may or may not be listed by the office/agent presenting the information.